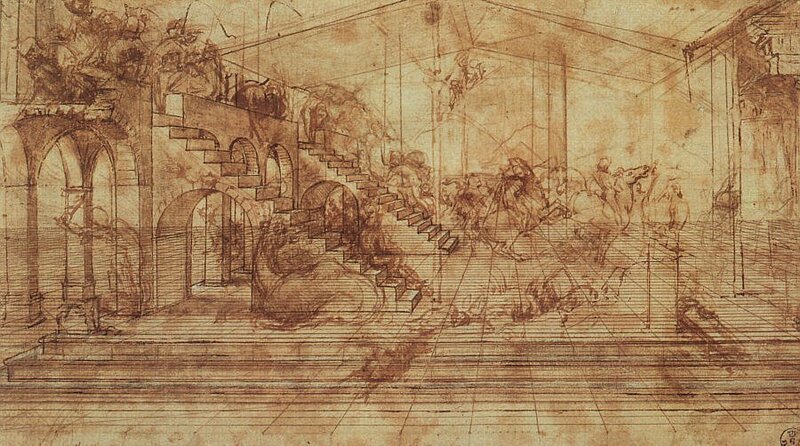 Linear perspective is the type which was systematized in the Renaissance. It follows several strict rules. One of the important ones is that there can only be one horizon line, and all vanishing points must lie on the same single horizon line. The above sketch shows an oblong shape rendered in two-point linear perspective. Imaginary lines extend outwards from all horizontal edges. The points where these lines converge are called vanishing points. And of course, all vanishing points are level with the horizon. 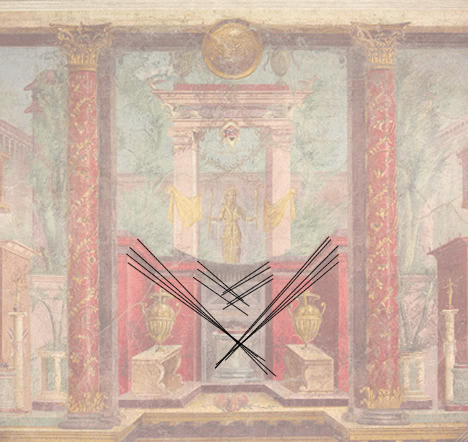 Now we’ve brushed up on the rules of linear perspective, let’s test and see if the architectural frescoes from the Villa of Publius Fannius Synistor obey these rules. 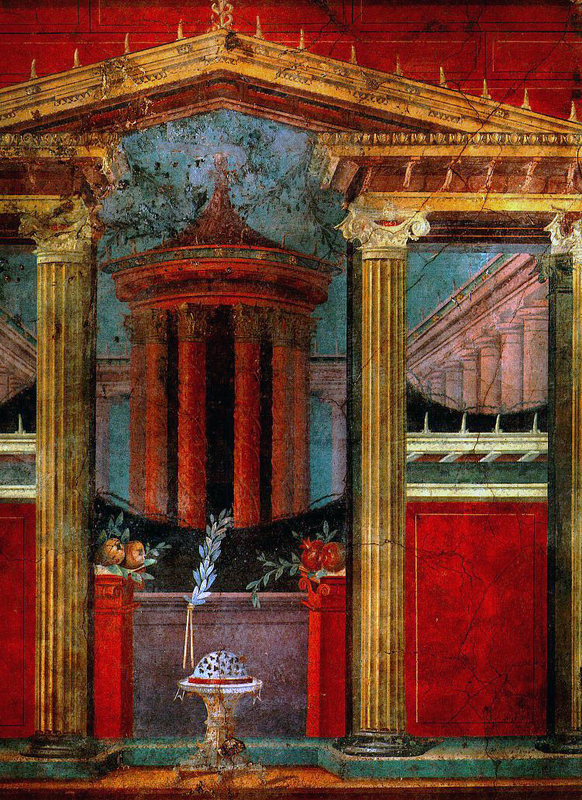 This villa was uncovered at Boscoreale, about one and a half kilometers north of Pompeii. I’ve selected one of the paintings on the wall of Synistor’s cubiculum. It is a symmetrical painting, but unfortunately the only high resolution photograph of it I could find was framed off-center. This says something about our changing tastes in art, too – we don’t like symmetrical compositions any more. But in any case, the rules of perspective will not be affected by how much of the picture is visible. At first this painting seems very promising. 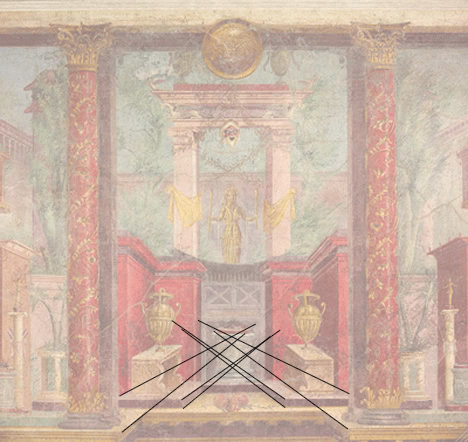 All the lines of the colonnade in the far background converge quite neatly on one spot in the middle of the painting. It looks like the start of true one-point perspective. But as the investigation moves to other areas of the painting, things get complicated. The horizontal surfaces at the tops of the foreground columns all converge on a different point – a much higher point – than the columns in the background. The vanishing point moves again and again, as you include different elements in the picture. But there are two consistent tendencies at work. Firstly, there is symmetry in this composition. 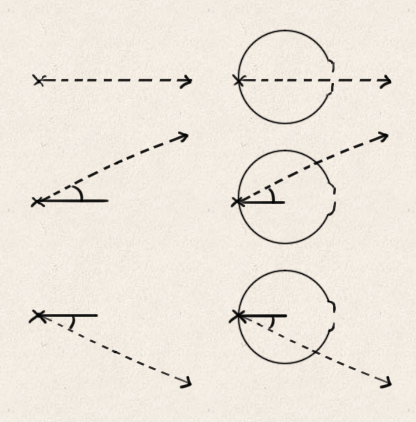 Objects to the right and to the left of the centre mirror each other, such that all the vanishing points are aligned along one vertical axis in the middle of the composition. The picture may flagrantly violate linear perspective rules, but the composition is not irrational. Its symmetry shows some level of foresight and planning. It is not something you would arrive at by sheer accident. Secondly, there seems to be a rule of thumb that the higher elements in the composition have higher vanishing points, and the lower objects have lower vanishing points. This painting, at least, is fairly consistent about where vanishing points ought to be, even though according to the rules of linear perspective they shouldn’t be arranged vertically like this at all. The vertical bracket here shows how far the imaginary horizon line wanders up and down the picture. The variance amounts to about 40% or more of the height of the picture itself. 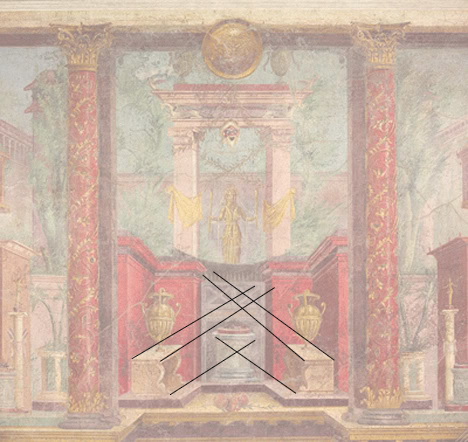 But before we try to systematize this pre-Renaissance perspective theory, let’s look at another symmetrical composition. 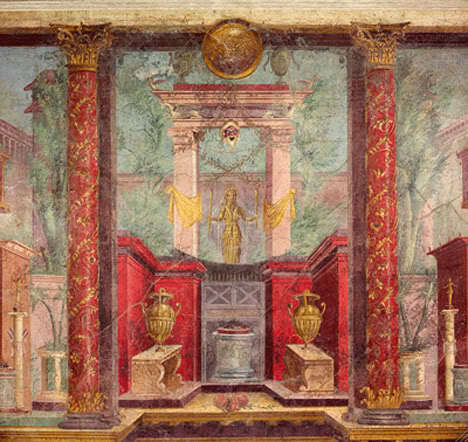 This painting was found in the same room, the same cubiculum, as the painting before. It was on a wall facing the other painting. The similarities in style strongly suggest that this was painted by the same artist (or artists) as whoever made the previous picture. As before, the same kinds of tendencies start to emerge. Objects mirror each other, and their vanishing points are aligned on a vertical axis. But in this picture there’s an extra variable. Some elements seem to have relatively more parallel-looking lines, while others more obviously seem to be converging. The lines on the floor are slightly more parallel to each other than the shrine walls above. The benches in the foreground show the greatest degree of parallelism. It almost seems like they do not converge at all towards any vanishing point. Because of the varying degrees of parallelism, this painting does not obviously seem to follow the rule of thumb outlined above. Objects higher in the composition do not necessarily have higher vanishing points than objects lower in the composition. And yet, despite all of these variances, these wandering horizons and varying levels of parallelism, the painting doesn’t look too bad. It may not be entirely consistent, it may thumb its nose at the rules of linear perspective, but the effect is not jarring. And that, actually, is more than what can be said for the perspective drawings which art students today are taught to produce. It takes a while, and a bit of fiddling around, but it seems no one really notices just how broken the linear perspective system is. What do you mean, linear perspective is broken? Well, let’s go back to our example drawing. This is the oblong shape in two-point perspective. Looking pretty fine so far. But I want to add another oblong shape below it. I’ll take my trusty ruler and extend the lines from those vanishing points below my current shape. Oh dear. That didn’t turn out well. It looks horrible. I have never seen a right-angled corner that sharp in real life. It’s an impossibility. Turns out, you can only draw linear perspective as long as everything fits inside a fairly tight window. Outside of this window, it all looks horribly distorted. If you want to fit another oblong shape below this oblong shape, you either have to rub everything out and put your vanishing points further apart, or shrink all of your objects to fit within the window you have. The Romans did something different. They eyeballed their compositions and moved their horizon lines accordingly. Like this. Here, the second oblong shape, a smaller boxish shape, has its own imaginary horizon line. Now of course this violates the rules of linear perspective – you can’t have more than one horizon line! That’s inconsistent. But notice how natural it looks. If you didn’t rule up all the lines to see where they met, you wouldn’t necessarily be able to tell that we used a different system of perspective. You would think the same things as that visitor at the Met museum – it looks like perspective. It’s not linear, it’s not mathematically quantified, and it wasn’t invented by the Renaissance. But, goshdammit, it works. There are multiple horizon lines. Symmetrical elements, or elements aligned the same horizontal distance from the viewer, share horizon lines. Elements higher in the composition have higher horizon lines; elements lower down have lower horizon lines. Vanishing points are vertically aligned with the corresponding points on different horizon lines. 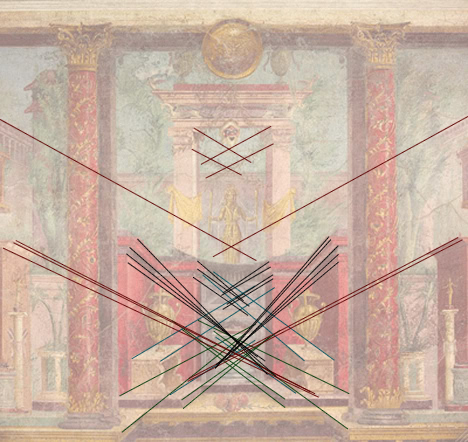 And this is the style of perspective employed by our Roman fresco painter. It’s not more primitive or naive, nor is it more calculated than the Renaissance model. It is actually more complex, in that it involves several more factors than the linear model. Because of its complexity, the artist has to use his or her eyeball to judge whether the picture looks balanced or not, whether something seems to stick out too much, or where any kind of adjustment needs to be made. It is both rational and organic, naturalistic and formal. It works well enough in both Roman and medieval art. But why does it work? How could our eyes see something wrong according to the linear model, and interpret it as something right? There is a critical factor which makes the linear perspective model stop working beyond its narrow window. We don’t see the world exactly the way a camera does. Cameras, unless they have special wide-angle-lenses, have a very narrow range of sight. The film takes a static image of whatever it is pointed at, plus a few degrees around it. That’s not how we form a picture of the world. We swivel our eyeballs. We do it constantly, because the best colour vision cells in our retinas are all clustered within a very small zone. So our eyes are constantly flitting around in our sockets. Our brain picks up all of what our eyes rove over, and stitches this together into a big picture of the whole scene. Now, this would not be too much of a problem for the linear model. 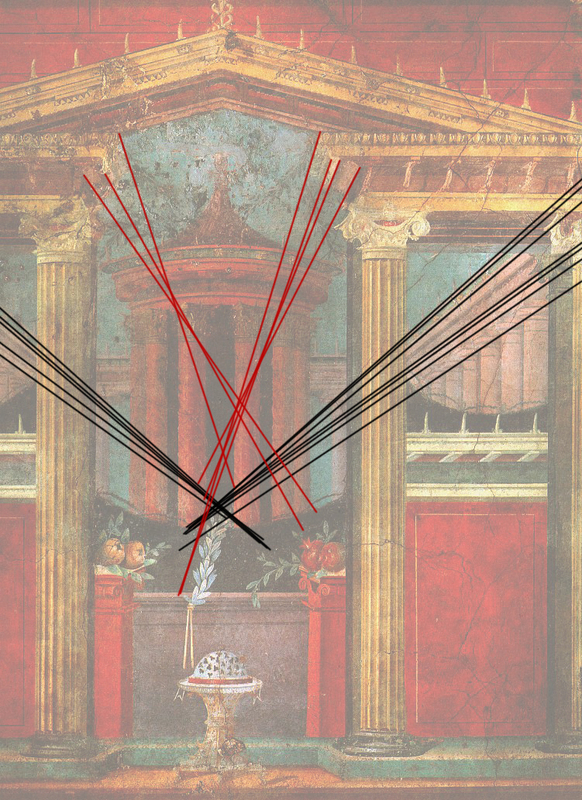 As long as all angles of our sight originate from one fixed point, the system should work. 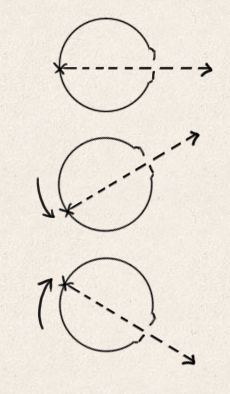 But can you see the problem with applying this fixed-point model to the tiny vision-spot of our retinas? As long as our eyeballs stay nested in our sockets, they will rotate on a central axis. This means that points at the extremities of the ball will move around as the ball swivels. Our retinas are at the back extremity of our eyeballs, and only one small spot on them has decent colour vision. That means that when we raise our eyeballs to the heavens, our point-of-vision moves downwards, and when we look down our noses at the ground, our point-of-vision moves upwards. By the rules of perspective, the horizon line moves when your point-of-vision moves. 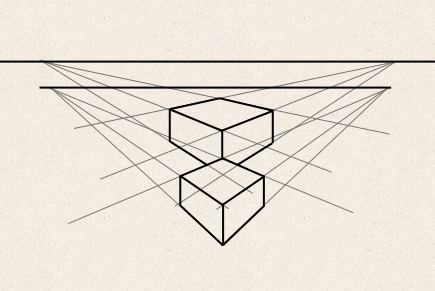 By insisting that there can only be one horizon line, linear perspective assumes that there is only one point of vision, and it never moves up or down. This is a vast oversimplification of the real situation. As a result, linear perspective has far more in common with the way a camera sees the world than how a human being sees the world, and it cannot accurately represent objects outside of a narrow range of sight. Perhaps the question shouldn’t be so much “how could a non-linear system of perspective ever look convincing?”, but “why do we put so much stock in linear perspective?” It is true that the Roman system does not appear to have been quantified mathematically, and so eyeballing involved a fair amount of guesswork and rule-of-thumbing. But that doesn’t mean it was irrational, or that the results were necessarily of lower quality. The triumph of linear perspective might actually be overstated. In the early 20th century, analytical cubists were seriously dissatisfied with the limitations of linear perspective. They attempted to paint with a much more complex and less predictable system of constantly changing viewpoints. They butchered, sliced and diced up the sacred cow of linear perspective. 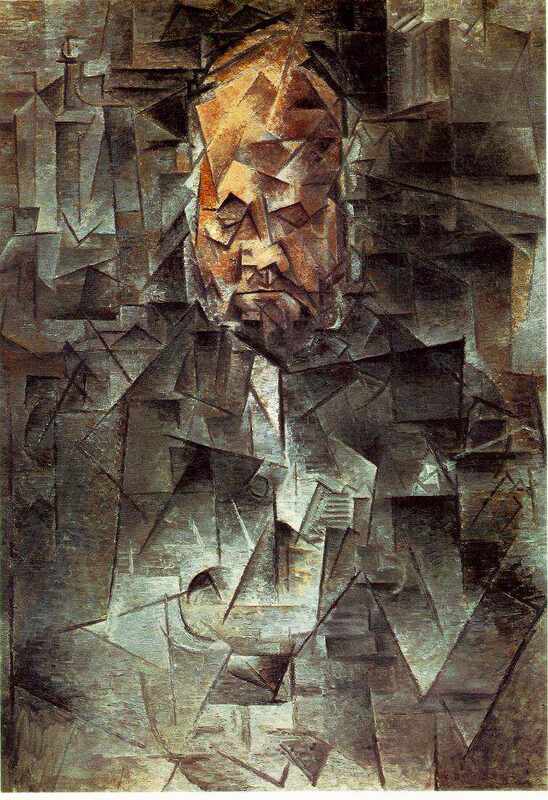 Pablo Picasso, Portrait of Ambroise Vollard, 1910. Of course, the cubists and the Romans had very different tastes. The cubists were so interested in the question of how to break out of linear perspective, they initially painted in muted colours to better focus on the fragmentation of forms within multiple viewpoints. 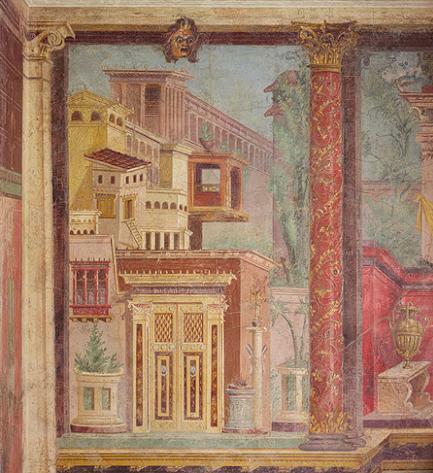 Romans loved bright colours, and if the writings of Pliny the Elder are any guide, they tended to prefer naturalistic renditions of people and spaces. But what these groups shared was a common disregard for the golden rules of one- and two-point linear perspective. Perhaps art history isn’t such a progressive tale of ever-mounting achievement. Perhaps it’s cyclical after all.